Mayon Volcano has a near-perfect cone shape, endowing it with symmetrical beauty. You can see all of its grandeur, from base to summit, because it sits alone above a vast sloping plane. Almost 50 other eruptions occurred over the past 400 years. That's an average of one every eight years. The latest eruption (2013) took the lives of some climbers. It happened in 1814. Over 1,200 people perished. Most of them took refuge in the church in Cagsawa. Unfortunately, lava and mud flows plus airborne ash and rock fragments buried the church. Today, only the church's reclaimed bell tower bears physical testimony to the resulting tragedy. It is now a popular travel attraction. 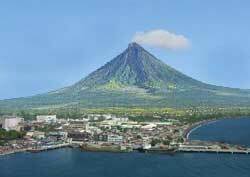 But Mayon is not the world's only near-perfect cone volcano. Other famous ones include Mount Fuji in Japan and Osomo in the Argentine-Chilean Lake District. The church bell tower offers a striking photo opportunity: The Mayon Volcano flanked by the lonely historic tower poking out of the ground.